The third in the Royal Mint's exciting Landmarks of Britain Series, the 2018 Trafalgar Square 1 oz silver coin is a must for serious collectors and a smart option for investors. Struck from one troy ounce of .999 fine silver and boasting an impressive reverse design by Laura Clancy and Glyn Davies, it will be the new highlight of your collection. One of the most recent collections from the Royal Mint, Landmarks of Britain is also among its most successful. The series began with Big Ben (2017) and was followed in 2018 by the Tower Bridge silver coin. Each reverse design was created by talented artists Glyn Davies and Laura Clancy. 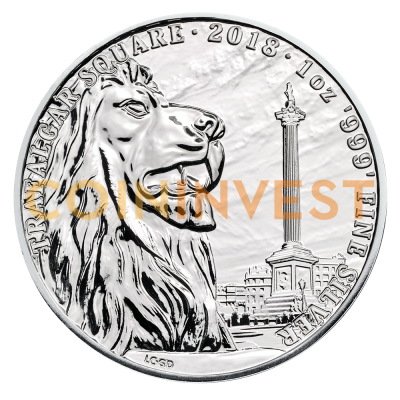 For the 2018 1 oz Trafalgar Square silver coin, they have chosen an impressive view of Nelson's Column with one of the famous lions in the foreground. Trafalgar Square is one of the most famous places in London and this superb addition to the Landmarks of Britain Series of silver bullion coins is a fitting tribute. The square was named after the Battle of Trafalgar (1805). Its iconic column commemorates Lord Admiral Horatio Nelson who lost his life leading the British navy against the combined fleets of France and Spain. It was designed by William Railton and erected between 1840 and 1843. Each 2018 1 oz silver Trafalgar Square coin shows the column from the south-east corner looking north-west. The National Gallery can just be seen behind the column, and one of the four magnificent bronze lions designed by Edward Landseer can be seen in the foreground. The obverse of each coin carries a portrait of HM Queen Elizabeth II. An essential buy for fans of historical themes or collectors of Royal Mint coins, the 2018 1 oz Trafalgar Square coin is also a great way to add value to your holdings with fine silver. Be among the first to get your hands on the 2018 1 oz Landmarks of Britain Trafalgar Square silver coin by ordering today with coininvest.com. Thanks to its legal tender status, this striking silver bullion coin is free from VAT and CGT exempt - should you wish to sell in the future, any profits will be tax free.